Polka Dot Retro Bikini: c/o OASAP. 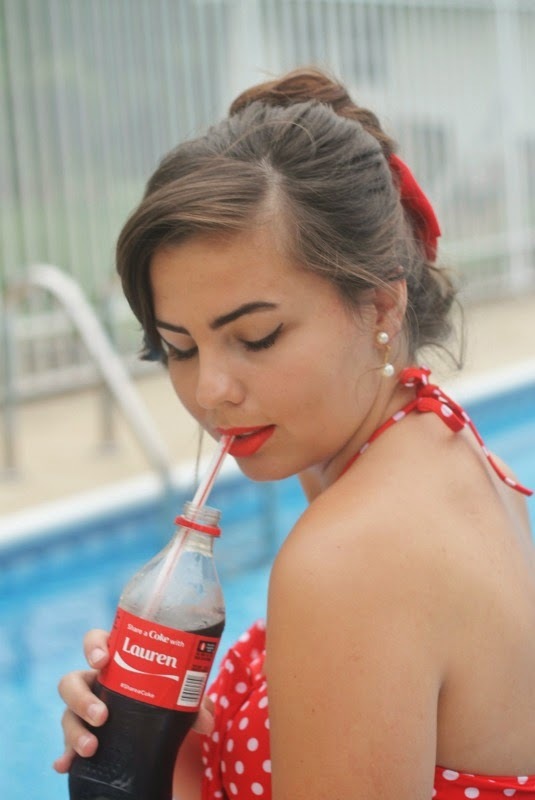 I've been waiting awhile to shoot pictures in this darling swimsuit, and when I found my name on a share a coke bottle the other day I thought, "I HAVE to pair these two together!" I absolutely adore coke and it's a bummer my campus is Pepsi; to me, there's nothing that can replace an ice cold coke (especially in a glass bottle, the best!). It's even better that this one has my name on it; yep, I'm one of those suckers that falls for the personal marketing trick. Anywho, I just think it's pretty cool to have a coke bottle personalized with my name! I'm doing floor sets for Aero both tonight and tomorrow night till the wee hours of the mornings. It's the big Aero Now launch event with all the new clothes and new image for the company. The clothes are SO cute guys...lots of cat things that make my heart happy with cute crop tops and quirky t-shirts. It'll be exhausting to put all this together, but it's always so rewarding to see the end result. I love these pictures, you look so pretty! Your whole outfit is just too awesome. You are truly channeling some high glam in these photos! You are stunning, Lauren. I remember when it was a big deal among my friends to get personalized JONES soda bottles. I still have one from when my friend graduated high school and got his photos on the bottle for all his friends. Coke is doing something very special for people and it's cool to see. OMG, you look gorgeous in that suit! Red is such a good color on you! Still lookin' for a coke with Angela on it, haha. 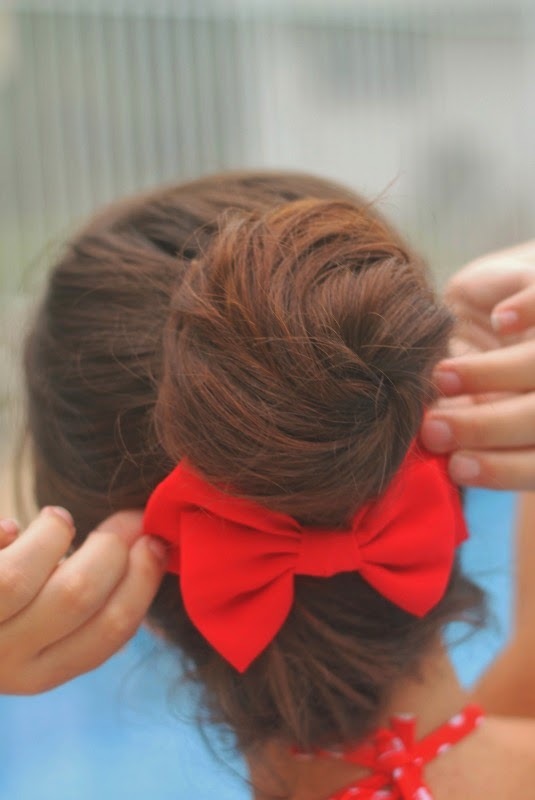 So cute!! I love the pictures and the suit! Lauren you are simply perfection my dear, your body is cracking! and you look like a modern day pinup sweetheart. I wish I had a pool! everything about this post is just wonderful. You are so beautiful! This bikini is so adorable too! 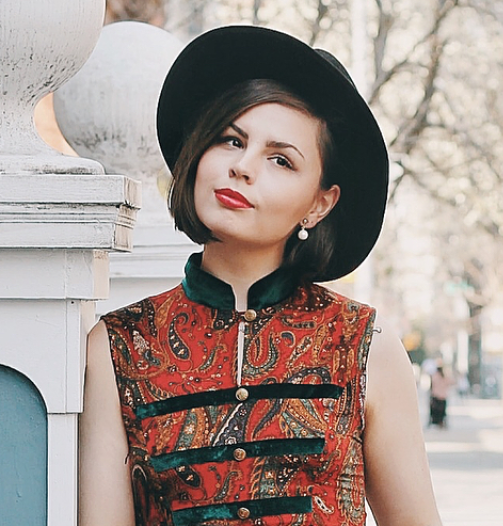 This outfit and these photos are just darling. You look beautiful. What a perfect swim suit! I'm a packaging sucker myself- it's amazing what some good marketing can do! Ahh this swimsuit is the cutest ever!! I didn't know Oasap carried swimsuits like this. You look absolutely wonderful in it. That's so cool that you found a coke with your name on it! And those glasses are amazing--love them! These pictures are so darn adorable. Love the retro look, and I've got to say - that swim suit looks fantastic on you. Really flattering style! 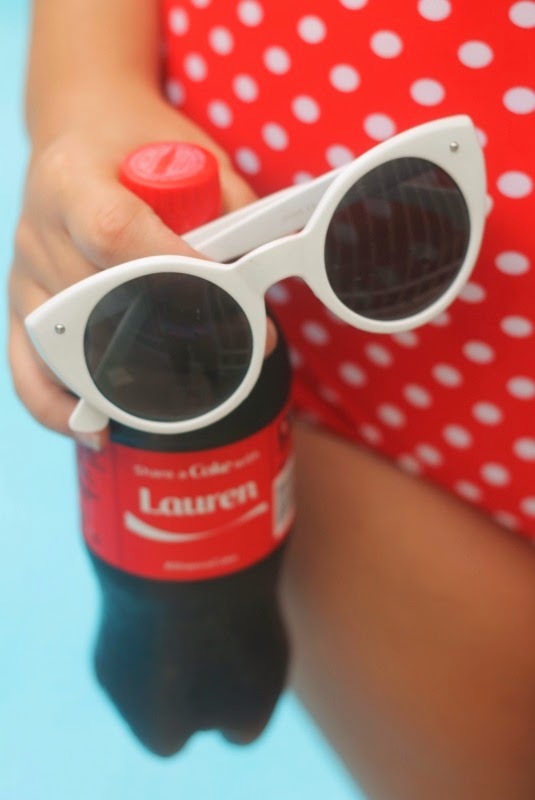 I soo need one of these high-waisted suits next season, this one is adorable :) Such a fun post with the personalized Coke! Looking absolutely adorable Lauren, love it! Ah I always hate doing floor sets! Also Id totally fall for the Coke name branding thing but my name is sort of unusual (Justine) that I haven't seen it on any of the cans. That swimsuit is so perfectly retro. I have this secret dream of finding mine and my boyfriend's names on coke bottles so we can take pictures together. It's stupid, but I think it'd be so cute! I've seen it on your ig post! good for you to have your name on it I'm still looking for mine tho ^^ love the swimmies :D red and polka best combi ever! Oh my goodness that is the cutest swimsuit ever. I don't know how I missed these photos, but wow! You are such a babe! Definitely have the 1950s bombshell look down to a tee! Cause' You're the Only One.